My journey into filmmaking has been incredible so far! However, exploring the world of sound was an area of study that I wanted to get better at. Discovering sound recording through the mindset of the masters has most definitely left me wanting more! I’ve met the most amazing people through my various film projects and also the people who are involved in the industry. I think what I really love about film is that you use all your senses to experience the world around you. Once you understand lighting, you end up seeing beautiful light everywhere you go. The same goes for composition, colour, movement, speed and of course sound. One of the reasons that filmmaking is hard, is because you have an overload of all these amazing sensory elements of the world around us. A successful short film in my view, is how you interpret this sensory overload and apply it to “story”. Story is everything! Its the principle means by which we engage and comprehend an underlying message, and above all else, its how the story makes us “feel”. Expanding my horizons in sound had become one aspect of filmmaking that I desperately wanted to cultivate, in order to help me make stronger stories. The tricky question is who do you learn from? My simple answer to this question is “if you want to know anything, go to the horses mouth”. In the arts this is a little more tricky to identify. One day I was browsing through YouTube and came across a video that focused on the sound recordist, Chris Watson. The film titled “The Colour of Sound” excited me immensely, and I had my sights set on the one person I absolutely wanted to learn from. You can tell in the 10 minute segment that Chris is deeply passionate and he looks beyond the technical noise that seems to pervade the industry. I loved the way Chris describes how he really listens to the environment and this was exciting and fresh to me. I was delighted to find that Chris does sound recording workshops through WildEye. An organisation dedicated to wildlife training and conservation amongst their portfolio of functions. Now, I wouldn’t say that I was a person who was deeply connected to nature and wildlife, despite having been born in Rhodesia (now Zimbabwe), and living in Southern Africa for my entire childhood. So going on a wildlife sound recording workshop did seem a little daunting to me, but I knew that whatever I gained from the workshop would put me in the right mindset. And so that became my ultimate outcome of the training, “To gain an insight into the mindset of a sound recordist”. Unfortunately I missed out on the 2014 workshop, but happily booked onto the next one to be held a year later, in October 2015. I set off on my journey, very excited that the day had finally arrived and I eventually found the small country lane of the venue’s location, deep into the countryside in Norfolk. I was greeted by Piers Warren, the founder of WildEye. Everybody was very friendly as if you had known them for years. It was immediately evident I was amongst great likeminded people. Jason Peters, the course co-ordinator at WildEye showed me around the venue and introduced me to the world famous, Chris Watson. We waited for the others to arrive while I chatted with the delegates who had already arrived. After dinner we entered the main room for our evening session. First up was sound recordist, Jez Riley French. Jez and Chris were the main instructors for the wildlife sound recording workshop. Jez talked for over 2 hours on some of his work and how he recorded the material. This completely blew me away! The sounds were incredible and how he recorded them was even more incredible! It felt like my objective of gaining an insight to a sound recordist’s mindset had already been achieved! If you haven’t heard of any of Jez’s work, you should listen to some of it now! Its amazing! I guess you could say that it was more towards sound art and sound design. It was mesmerisingly beautiful! In the last half an hour, Chris played a piece of his that was about an old house. He turned off the lights and we were blown away with how the visual senses were awakened through sound. It was so amazing that I realised for the first time that sound could be better than the moving picture! The next morning was a full session from Chris about his approaches and strategies to sound recording. This covered some of the very deep questions I’d hoped would be answered. I could relate Chris’s words with how I would use sound to tell stronger stories. Later during a tea break, I was pleasantly surprised to learn that some of the same techniques I use for preproduction in film, are similar to Chris’s preproduction for sound recording. The session went into the afternoon covering microphones and sound recorders. This was really interesting because although I have some of the types of gear being presented, it had never occurred to me how else I could use them! It comes back to the age old quote, you can have the gear, but it’s how you use it that counts! I can see myself being a more capable sound recordist using the gear that I already have. We headed out into the countryside near the venue in the afternoon. We tried various microphones and went looking for interesting things to record. I mainly used my shotgun microphone in a hand held blimp wondering about the place. Jez and Chris were on hand to help out and point people in the right direction. At one point, I listened to sound being captured using parabolic reflector which completely took me by surprise. Listening to sounds, amplified with crisp detail in a highly directional spot some distance away. Around 5pm Chris setup a stereo mic in a small opening at the edge of the woodlands. Chris discussed microphone placement and the decisions he was making, then ran a long 100 metre stereo cable back to the main presentation room in the house. It was amazing! It felt so-real to hear a live recording of the woodlands outside. It was like being in a wildlife documentary as Chris narrated what was happening outside, as the birds were coming in to roost for the evening. We listened to the whole event on a 4-speaker system. It was so immersive and beautiful. After dinner the group split up and I went with Jez to learn more about using his contact microphones. The concept of using these devices is so new to me that I wanted to know more about how to use them. We attached them to fridges, kettles, toasters, floorboards, anything that might cause some level of vibrations. A very interesting exercise! We later congregated again to listen to another one of Chris’s pieces about a garden. Again, the visual nature of the sounds was mind blowing! The last day we were up early. We headed out to a nearby lake with lots of woodland. We travelled together in a mini-bus to this rural location. The lake was a sight of beauty. There was a single lonesome swan swimming with a misty haze hovering above the landscape. Jez brought some of his hydrophones for us to use. Unfortunately there wasn’t much activity in the waters near us, but you could hear some fish in the vicinity. Chris and Jez checked up on various people and helped with practical advice. I wondered off with another delegate into the woods. I setup a stereo microphone on a stand after we identified a suitable spot, far away from everybody else. It was amazing! I’ve never just listened before… When walking out in the woods, you usually have something on your mind and you just pass through it at a good pace. I actually “listened” to what was being recorded, putting the advice we had learned over the previous 2 days into practice. I could hear the sounds that stood out from the rest and over the course of time, I could hear the woodland changing in tone. It was beautiful and surprisingly amazing! From that very moment, I felt myself becoming more connected with the natural world. I’d say that it was a reflection point in my life… Later on as we were heading back, Chris explained a few other aspects of field recording and instead of talking about it, he took me to a remote location and showed me. Guiding me through the choices he was making. It reminded me of how important tacit knowledge is! Tacit knowledge being knowledge that cannot be learnt from written material alone. You either have to be shown or you have to find your own way of doing it. For example, you can’t learn to ride a bicycle by reading a book. If you want to record sound like Chris Watson, then you have to be with him to see how he does it. There I was having a 1-to-1 with Chris as he talked me through the various options and the pros and cons of what we were recording. Amazing! We all headed out to a private railway station. It had been prearranged for us to have access to various parts of the site. I stayed with Jez so I could learn more about using contact microphones. He attached them to the crevices in the wooden sleepers. I setup my stereo microphones and plugged both sets of microphones into my sound recorder. Wow! The sound of a train passing was amazing! But it was even more amazing when combined with the contact microphone. It had a richness and deep rumbling to the sound. I couldn’t help it, but smile as I was recording it! Incredible! Needless to say, I purchased one of Jez’s contact mics. After lunch we picked out some of our best recordings and played them in a group setting. Wow! It was amazing what people had recorded! 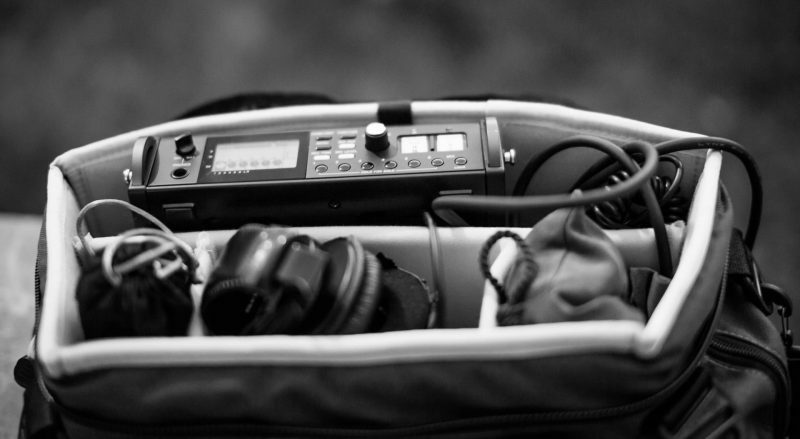 Many of the recordings were made with affordable portable recording units and microphones. Again, its how you use them that is important! You don’t need thousands of pounds worth of equipment to make a good and interesting recording. The workshop sadly came to an end… but my journey has taken a new road… I now have ideas of making a series of short films about the places we live and appreciating the natural world we live in. Dear Gwyn. Thank you so much for pointing this post to me. Really interesting. I myself came from the visual side of things and came into sound recording later. Like you I’m not as interested in the wildlife aspect but more in the spacial sound narrative in human environments, but I can imagine how useful this workshop was to develop your own sensitivity and production in sound work. Thanks for sharing. All the best.